You may have signed several affidavits over the years, without fully knowing what they are. You might have signed one to register to vote or obtain some government benefit. An affidavit can also be used as evidence in a lawsuit. An affidavit is a written document. The person signing it (the “affiant”) declares under oath that he or she is making voluntary and truthful statements. Requirements for an affidavit vary based on the circumstances and jurisdiction. In most jurisdictions, an affidavit must contain the affiant’s name, physical address and the affiant’s signature. The contents need to be voluntary and limited to what the affiant knows to be true because of direct observation or experience. Before signing an affidavit, be certain of the basis of your knowledge. Do you know these statements to be true or just think that they’re true? 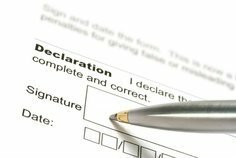 Most jurisdictions require the affiant swear under oath that the statements are true before signing the document. That signature needs to be witnessed and certified by a notary public, attorney or other public official authorized to take oaths. The affiant must understand the content of the affidavit, the importance of an oath and the consequences for violating an oath. A person who lies on an affidavit may be deemed to have committed perjury and face considerable penalties. Given the significant consequences, anyone who is not mentally competent shouldn’t sign an affidavit or be asked to sign an affidavit. You may be asked to sign an affidavit if you witnessed an incident that may lead to, or has already resulted in, legal action. Parties, or their attorneys, may want a formalized, written statement of what you saw. If you’re in this position, make sure the affidavit is complete and accurate. Consult your own legal counsel before signing. The party contacting you may want an affidavit that puts them in the best light, not one that tells the whole story. Be very careful about what’s stated in the affidavit, as opposing counsel may focus in on the document and investigate every aspect of it during litigation. In a deposition or during a trial, opposing counsel may press you on the contents of affidavits to impeach your credibility. Is this the first affidavit on this topic? If not, review the previous affidavit(s). If something you previously stated was true, but you now know is false, you need to discuss with your attorney how this should be addressed. Before signing on the dotted line of an affidavit, think it through and make sure the information presented is accurate. If you have any questions about an affidavit you’ve been asked to sign, or want to sign for your own purposes, consult with an attorney who can review it to ensure it is optimally drafted and does not end up getting you in hot water.